"Fingerprints, before DNA, were always considered the gold standard of forensic science, and it's turning out that there's a lot more tin in that field than gold," he said. "The public needs to understand that. This judge is declaring, not to mix my metaphors, that the emperor has no clothes." The judge did this because of the partial fingerprint false positive linking an Oregon lawyer to the Madrid bombings. Apparently that was only one of twenty false matches in that case. 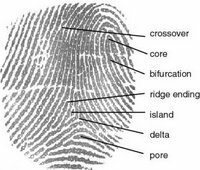 So the judge in this homicide case has ruled that partial fingerprint matches can't be used as evidence. "The state is correct that fingerprint evidence has been used in criminal cases for almost a century," Souder, the judge, wrote in her decision. "While that fact is worthy of consideration, it does not prove reliability. For many centuries, perhaps for millennia, humans thought that the earth was flat." So if a hundred year old "gold" standard of evidence turns out to be tin, what about all the wide-scan wiretap dragnet evidence that certain governments seem intent on compiling these days? PS: Seen on Bruce Schneier's blog.